1. Dry roast the coconut, garlic, ginger and red chillies. 2. Transfer to a mixer jar and add the jaggery, turmeric powder, salt and tamarind extract. 3. Grind to a fine paste. 4. Heat 1 tsp of oil in a deep frying pan. 5. Add the ground masala and little water. 6. Fry for a minute and add 3/4 cup of water. 7. Simmer for 10 minutes and add the prawns. 8. Cook for 10 minutes. 9. Heat 1 tsp of oil in a small frying pan for tempering. 10. Fry the mustard seeds, fenugreek seeds and curry leaves. 11. Add to the prawns and mix well. 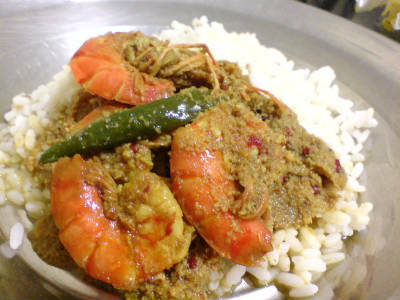 Feel free to comment or share your thoughts on this Mangalorean Prawn Curry Recipe from Awesome Cuisine.